The F-4 Phantom II (McDonnell, then McDonnell Douglas after 1967) is a tandem two-seat, twin-engined, all-weather, long-range supersonic jet interceptor fighter/fighter-bomber originally developed for the U.S. Navy by McDonnell Aircraft. Before 1962 it used the Navy designation F4H. f Toggle refueling probe Refueling receptacle door on USAF and related variants. The model is set to initialize on the ground with engines running, parking brake on, flaps up, canopy closed. 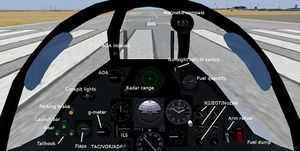 Set flaps to full, release parking brake (runway launch) or engage launch bar (carrier launch). Note: for light weight takeoff use flaps half. Full throttle. For carrier launch activate catapult. For runway launch rotate at 150 knots. When airborne raise gear and set flaps to half. At 200 knots set flaps up. To save fuel, come out of afterburner at 350 knots. Climb at 400 knots then 0.9 Mach. Idle power, speedbrakes as necessary. Gear and flaps down below 250 knots. Retract speedbrakes. Hook down for arrested landing. AOA on speed (about 140-150 knots). RPM about 85%. Descent rate about 700 fpm. Throttle idle. Deploy drag chute. Brakes as required. Release drag chute when clear of runway. When stopped:  Raise hook, fold wings, open canopy, raise flaps, follow marshaller's signals. This page was last modified on 20 June 2016, at 22:46.